One of my particular passions is the environment and helping to protect it. In the UK I had my routines and knew how to reduce, reuse and recycle pretty much everything I could, and where to buy local and/or organic produce. I hoped that I was lessening my negative impact on the earth by doing so. When I moved in Brno, I must admit that quite a lot of that went out of the window for a while, whilst I was acclimatising to the new culture. Now I've had a bit of time to investigate, I thought I would pass on my knowledge to those of you that also care about the environment. I have met with the Ecological Institute Veronica whose mission is "to support environment-friendly attitudes towards nature, landscape and their natural and cultural values". Their website has been incredibly useful, in particular the Ekomapa. 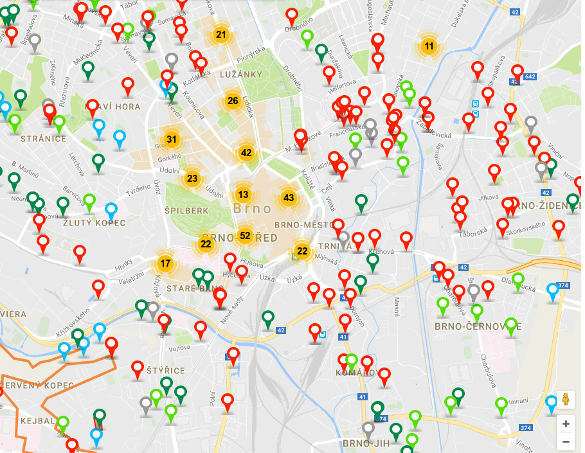 This map will show you where to find organic food, ekoflorists, waste collection centres, environmental organisations, nature walks and more. kitchen and garden waste – if you have a lot of garden or kitchen waste (vegetable matter only) you can take it to one of Sako's waste collection centres. Unfortunately, this is not a practical everyday solution. If you are lucky enough to have a garden, then a compost heap is your answer. Be aware not everything can go into your compost, as a small one will not reach temperatures that kill certain bacteria, so stick to vegetable matter. If you don't have a garden, and you are feeling brave, there is always an indoor wormery! You can find a lot of information on the internet about them and once again Veronica can help you out. Currently Brno have no plans to have collection bins for this on the streets as it is expensive, difficult to regulate and can be a bit smelly. Of course, it is always best to reduce and reuse rather than recycle. Veronica has lots of ideas on how we can do this. It would be great to hear how other expats get on with being "eco" here. Tell us what you struggle with. Or you may have experiences of brilliant "green" schemes from your homeland, that may work here. Please take a few minutes to answer the questionnaire and help to make Brno even more environmentally friendly! The survey will be open until June 30, 2017. Hannah Boylan has a background in ecology and since moving here, spends her time looking after 2 boys and volunteering with environmental organisations. It was originally written for the Brno Expat Centre's blog.